How do you mark your kittens when you have a large litter, and all look the same? Some use a colored necklace, others paint some nails with nail polish, others cut a little bit out of the fur and I use cattle marker. But do you use and why? On the photo the necklace. On this photo Oksana marked with cattle marker. I have not understood, how you use a marker. What paint? When I read cattle marker, I had this image in my mind of cowboys branding cattle with a hot iron! I know it could not be but I had to see the picture to realise what you meant. By the way, how long does it stay on the ears? Is it hard to remove? Cute, those pink ears! Makes a nice change from all the grey. A great idea! The two litters that have been born here never caused a problem, being household cats and a mishmash of all colours. Lola had a similar, all blue brother and I could only tell them apart by inspecting their private parts. 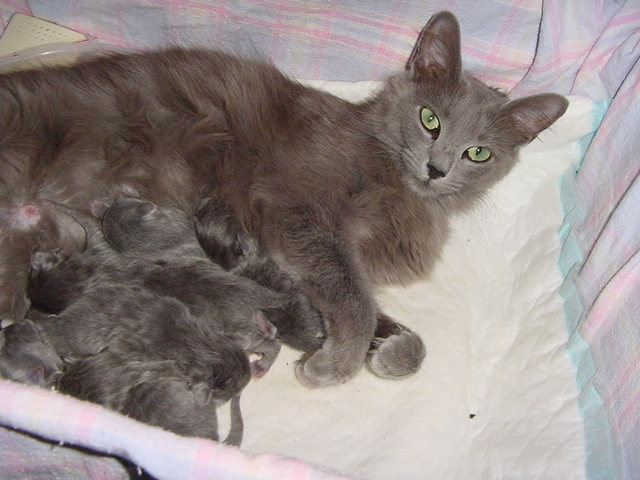 The second litter consisted of two grey brothers, one black boy and one grey girl. One of the grey boys had ghostmarkings, so telling who is who was not a problem also. But it must be hard with a all grey, pure-bred litter to tell them apart the first weeks. When they get older, they get more personality and the differences are more clear. It's a crayon. It feels almost like the crayons children can use. This is discription I found on an website. And I have to say it does not last really long as cats clean themselfs. So most of it is off within a few days. Animal marking sticks are applied mainly for short-term marking of cattle, sheep and pigs. For good visibility apply marking colour to the upper back of the animals. The marking is durable for approx. 4 weeks on cattle and sheep, and approx. 1 to 2 weeks on pigs. RAIDEX Animal Marking sticks are based on special waxes, paraffin oil and high-quality dyes. These marking sticks are easily applied to animal skins. They are heat and cold resistant, highly colour-intensive and luminous. The material contents are not harmful. laurence wrote: Great LOOOOOOOOOOOOL Anke! Marleen wrote: Cute, those pink ears! Makes a nice change from all the grey. A great idea! Regardez bien, combien en voyez-vous ? Look at well, how much see some you? That is easy Bernard, just count the legs, 28, and divide by 4!